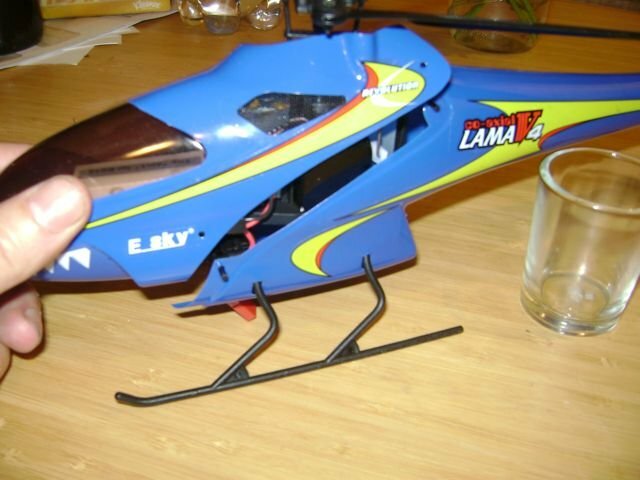 This page contains information about the Esky Lama V4, a fun, 4-channel RC helicopter that can be purchased inexpensively from locations such as coolneon.com. I purchased one of these and have been enjoying it a great deal! BoomTownHobbies.com, from which you can by XTreme Hard Blades. You'll need these much sooner than you think because even though the Lama V4 comes with a spare pair of upper and lower blades, you'll probably trash both pair before you manage to learn to fly in a oval path. I'd also advise you to buy a set of the unbreakable landing gear as well. The ones that come with the helicopter will break and you can't fly it without them. I also busted my canoy shell, so I bought an Xtreme shell. 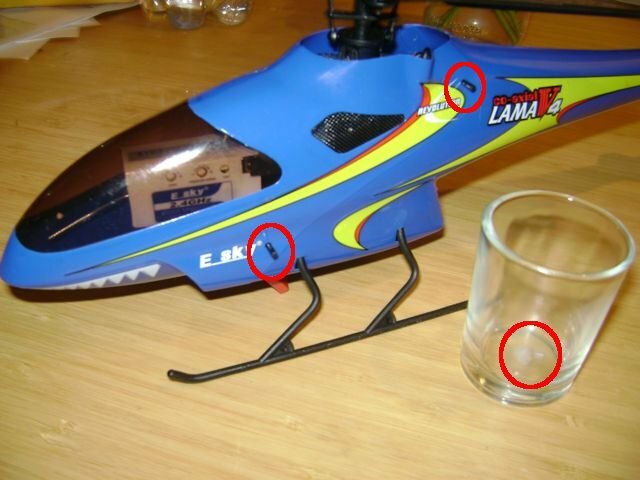 (Mine broke when the copter fell from about 50 feet onto grass -- my own fault. The copter was fine, actually. Only the canopy broke.) This place has wonderful customer service! dealextreme.com has free shipping! I bought a battery from them. It came without the small velcro attachment. I added my own velcro. Having a second battery is great! An excellent list of vendors of helicopters, parts and related stuff. One thing I discovered is that if your throttle stick is on the left, you have a "Type 2 Transmitter" and folks elsewhere on the net recommend changing the servo reversing switches on the lower right side of the transmitter to up-up-down-down when seen from left to right. Ok, did that... charged up the battery and I was ready to fly, or so I assumed. But, I could not get it to work! The transmitter and receiver are new RC technology that pair to each other, similar to the way a bluetooth headset pairs with a mobile phone or a computer. 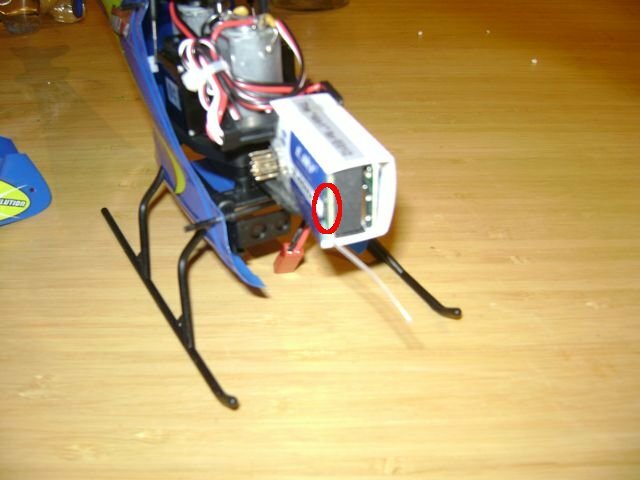 The receiver inside the helicopter has an LED that would flash red and green alternately. It will be solid green when it is paired with the transmitter. I could not get them to pair! The "manual" is rather poor at explaining the procedure, and surprisingly, the discussion forums I found were also not very helpful either. It seemed though that a lot of people were having the same difficulties. Turn the transmitter off and unplug the helicopter batttery, but leave the battery inside the helicopter as if you were about to fly it. 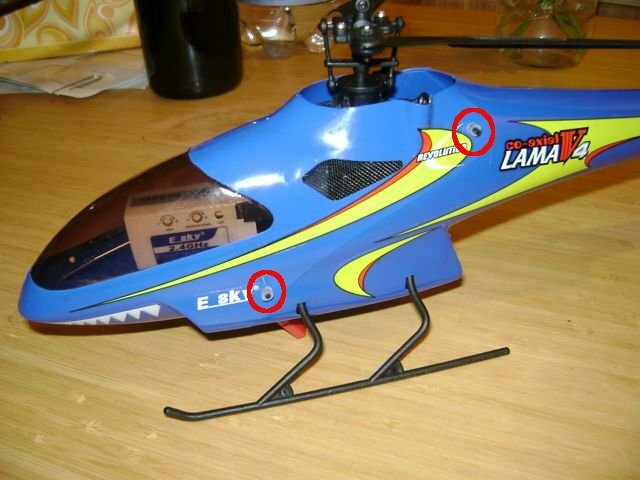 Carefully pull the small rubber rings off the pins on each side of the helicopter body. DO NOT PULL THE PINS OUT!! Place the rubber rings into a small container so they don't get lost. Carefully lift the sides of the front shell of the helicopter off these pins and set the front shell aside. The transmitter is the white rectangular object in the front. DO NOT ATTEMPT TO REMOVE IT! You've been seeing the red/green LED on the right side of the receiver as seen from the front. There is a very small pushbutton on the front of the receiver -- this is the unbind button that you will need to press... but not yet. Plug in the battery (even though the transmitter is not on). Look on the left side of the receiver and press and hold the unbind button until you see the orange LED flicker quickly. Now pull the throttle all the way back toward the bottom of the transmitter. It is the unsprung control stick -- it will stay in that position without you holding it. Turn on the transmitter and look again at the right side of the receiver. If all has gone well, after about six to ten seconds the LED that was flashing red and green will become solid green. You can test this by moving the throttle very slightly away from the bottom until the blades begin to spin just a little. Then slide the throttle back down. 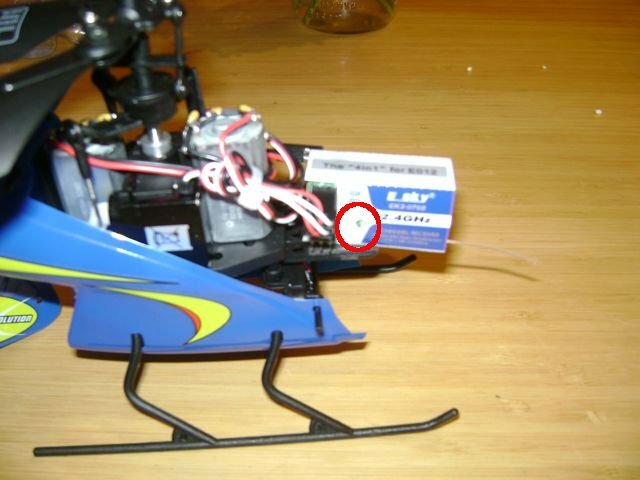 Also make sure not to push the pins back into the body when you slip the front shell back. It seems much harder to get the shell back on than to get it off, but if you line it up by eye you can get the shell back. Replace the rubber rings to keep the pins from shifting. You should now be able to fly! In my experience, once you have gone through the unbind sequence, the transmitter and receiver won't need this procedure again even if you unplug the battery and turn off the transmitter. After a particularly hard landing I found the top blade had lost all power. The bottom blade spun, but not the top one. I thought I had lost a gear or broken something and I took the shell off to investigate. What I found was that the entire drive shaft had slid down inside its plastic sheathing between the motors and the large drive gears on the bottom had slide down so that one was no longer in contact with the metal gear on the motor. All I did was pull the drive shaft up to re-engage the gears and everything worked great. Sometimes the helicopter won't go forward. It just wants to go backwards. At best you may get it to stay approximately in the same position even with the tilt stick all the way forward. The most likely cause is that the battery has shifted backwards slightly. Make sure it is all the way forward in its compartment. Even the position of the battery connectors can make a slight difference. I like mine inside the front shell and forward of the battery. You need to rebind the transmitter and receiver. 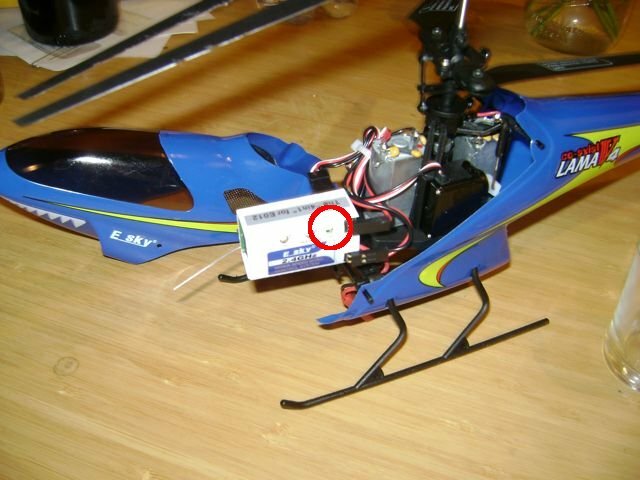 See "How to Rebind the Transmitter and Receiver" above. Copyright 2010 Howard Cohen. All rights reserved worldwide.